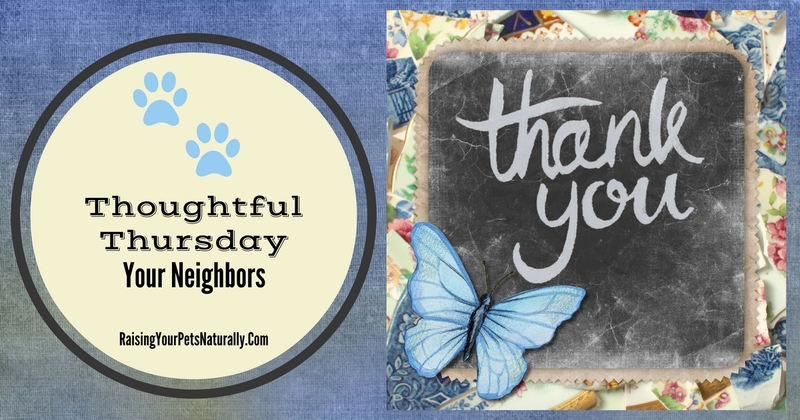 One of the things I do in my professional dog training career is to help my dog training clients make peace with their neighbors. You may be asking yourself why a dog trainer would have anything to do with a dog training student’s neighbors, but it’s pretty simple when you think about some of the reasons a client may call on a positive dog trainer. Ah, now you can see how a client’s neighbor may be upset by their dog’s behavior. The first thing I recommend to a new dog training client is to stop over to their neighbor’s home and explain to them how they understand the stress their dog’s behavior has caused. After acknowledging their neighbor’s stress and concern, tell them how they are actively working with a dog trainer on changing their dog’s behavior. However, I also suggest letting the neighbor know there will be a learning curve with some ups and downs, and reminding them that a good dog training plan takes time. Then comes the gift of appreciation. A nice batch of freshly baked cookies, a gift certificate to a local restaurant, or tickets to a sporting event just might be the icing on the cake. The last words of advice is to follow up with their neighbor and to ask if things have been better on their end, or if there is anything else they can improve on. Maybe the neighbor puts the baby down for an afternoon nap and would appreciate if your dog stayed inside during that time, for example. You’d never know if you didn’t ask. It takes a community to raise a well-adjusted dog, so don’t feel like you have to do it alone. Is there someone in your life you should send a thanks to? Tell me in the comments.